As the best-selling SUV in the brand’s 32-year history in America—with sales of more than 1.6 million units—the Santa Fe represents Hyundai’s strong SUV heritage and continues its success story. On sale now, the fourth generation 2019 model builds on this success offering an all-new family-oriented interior, loaded with practical cutting-edge technologies and bold exterior looks. The five-passenger Santa Fe Sport will now be called Santa Fe. The current long wheelbase three-row, seven-passenger model called Santa Fe has been renamed Santa Fe XL for the 2019 model year. An all-new three-row, eight-passenger SUV is currently under development and will carry an all-new name. The face of the new Santa Fe is highlighted by Hyundai’s signature Cascading Grille and a Composite Light design comprising LED Daytime Running Lights positioned on top of the LED headlights. The exterior design is characterized by a powerful wide stance and an athletic body that makes a statement from 100 feet away. It’s a bold look that is enhanced by refined lines that reinforce the vehicle’s status in Hyundai’s SUV lineup. The profile of the Santa Fe features a dynamic character line that goes all the way from the headlights to the taillights and a larger daylight opening (DLO) with a satin surround that provides a sleek impression along with better visibility. Featured diamond-cut 19-inch wheels communicate strength, as does the car’s rear appearance, now featuring a muscular high and taut shape. The Santa Fe interior design combines premium quality with a roomy layout featuring a strong horizontal design theme and enhanced visibility. Premium touches such as the layered, three-dimensional instrument panel and contrasting seat stitching ensures a high level of luxury within the cabin. The Santa Fe’s larger DLO enhances the interior’s feeling of openness with generous amounts of natural light. Improved ride comfort, handling and stability are achieved through key developments in the suspension geometry of the 2019 Santa Fe. The biggest change sees the rear shock moved upright from an angled position, improving the ride and handling no matter the driving conditions. Hyundai’s standard Rear Cross-Traffic Collision-Avoidance Assist (RCCA) puts eyes and legs in the back of drivers’ heads. Using the Blind Spot Detection system’s radar sensors when backing up, the system can not only warn the driver if vehicles approach from the rear side, it also applies the brakes automatically. Additional safety features include the optional Rear Occupant Alert, which Hyundai is debuting with the Santa Fe. The system monitors the rear seats using an ultrasonic sensor that helps to detect the movements of children and pets. The system first reminds drivers to check the rear seats when exiting the vehicle with a message on the center instrument cluster display. If the system detects movement in the rear seats after the driver leaves the vehicle and locks the doors it will honk the horn and send a Blue Link alert to the driver’s smartphone via Hyundai’s Blue Link connected car system. The system is designed to prevent children and pets from being forgotten in the car, but it also helps in case children accidentally lock themselves in. The 2019 Santa Fe also features Hyundai’s first standard Safe Exit Assist system. To enhance the safety of Hyundai’s passengers, Safe Exit Assist uses radar to detect cars approaching from the rear and cautions passengers looking to exit the vehicle. If a passenger attempts to open the door when a car is approaching from behind, a visual and acoustic warning on the center cluster will alert the driver. In addition, if the driver attempts to deactivate the Electronic Child Safety Lock feature, Safe Exit Assist will override the driver and ensure the rear doors remain locked until the approaching vehicle has passed. Once the road is clear, the driver can then deactivate the Electronic Child Safety Lock and successfully unlock the rear passenger doors. Interior cabin space has been enhanced on the 2019 Santa Fe. Inside, there is now more cargo room behind the second-row seats. In addition to more cargo space, second-row leg room has also been lengthened to be best-in-class. The H-point distance between the first and second rows has also been increased and the floor has been lowered for even more second-row comfort. Engineers also have incorporated one-touch folding second-row seats. The new Santa Fe’s exterior has also grown in size, giving the vehicle even more presence. With a length of 188 inches, a width of 74 inches and a longer wheelbase, it also provides more comfort for passengers than the outgoing 2018 Santa Fe Sport. Visibility has also been emphasized with the next generation Santa Fe. To help the driver, the outside mirrors are mounted lower and further rearward and the A-pillars have been reduced in size. For the driver and rear seat passengers alike, the rear quarter glass has been increased by more than 40 percent. The 2019 Santa Fe line-up offers a choice of proven powertrains. There is a 2.4-liter inline four-cylinder GDI engine with 185 horsepower or a more powerful, turbocharged 2.0-liter four-cylinder engine with 235 horsepower. All engines are mated to a brand-new eight-speed automatic transmission. The newly developed transmission provides quick and crisp shifts for a more engaging and efficient driving experience. Despite having two extra gears, the eight-speed transmission, which was designed in-house, is lighter than the outgoing six-speed model. The automatic transmission adds ratio range at both the top and bottom of output speeds allowing for extra thrust off-the-line and a quieter, more fuel-efficient dash down the interstate. A multi-disc and individually controlled hydraulic channel torque converter improves responsiveness by expanding the direct connection band, while a downsized oil pump and double ball bearings minimize friction loss. 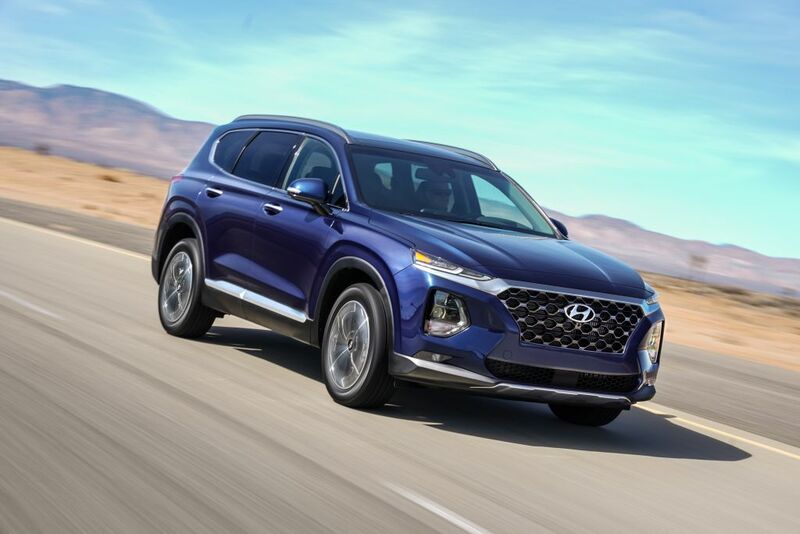 The 2019 Santa Fe has Hyundai’s HTRAC® All-Wheel-Drive (AWD) system. The HTRAC AWD system was developed as a multi-mode system, providing an electronic, variable-torque-split clutch with active torque control between the front and rear axles. The driver-selectable HTRAC Normal, Sport and Smart modes help provide confident control in all weather conditions. The Sport setting gives a more agile feel by sending more available torque to the rear wheels, for a sporty dynamic feel when desired. This system has a wider range of torque distribution variability than many competitive systems and has been tuned to conditions such as straight-line acceleration, medium- and high-speed cornering, and hill starts. The 2019 Hyundai Santa Fe is loaded with technology, including Hyundai’s latest AVN 5.0 navigation system with Android Auto™ and Apple CarPlay™ offered with higher level trims. The base level trim gets a standard 7-inch user interface, also equipped with Android Auto and Apple CarPlay. And to eliminate the need for a charging cord, there’s an available Qi wireless charging pad for compatible Android devices, as well as Apple iPhone 8 and iPhone X. When it comes to audio technology, the available premium sound system is well-suited to the Santa Fe’s upscale interior. The 630-watt, 12-speaker new Infinity branded stereo system with an 11-channel amplifier features Clari-Fi and QuantumLogic™ Surround Sound technology. Clari–Fi works in real-time to rebuild audio details lost in digitally compressed music, while QuantumLogic™ extracts signals from the original recording and redistributes them into an authentic, multidimensional soundstage for playback that is clear, refined and full of detail. The result is a more robust and enjoyable on-road listening experience. Smart Speed-Dependent Volume Control can automatically adjust the audio volume up or down based upon the vehicle’s speed and the system’s volume setting. The gain will change proportionally to the vehicle’s speed to overcome associated noise masking effects of the vehicle and thereby reducing the need to adjust the volume while driving. Additionally, the volume setting will taper the gain applied as the volume setting increases. This prevents the system from increasing volume further once road noise has been overcome. Taking inspiration from aircraft technology, an available Heads-Up Display (HUD) projects an 8.5-inch virtual image onto the windshield, enabling the driver to keep his or her eyes on the road. The feature uses a system of mirrors combined with a TFT LCD display and features adjustable brightness to ensure both excellent daytime and nighttime visibility. Driving information such as speed, Smart Cruise Control status, navigation, Blind-Spot Collision Warning, Forward Collision-Avoidance Assist, speed limit, Lane Departure Warning and audio system data is projected at a perceived virtual distance approximately seven feet ahead of the driver for maximum legibility.